What will $80 buy you? How about Final Fantasy XII-2, the game's soundtrack, some snazzy artwork, and a retailer-specific bonus? January 31st is starting to loom pretty large on the horizon, which means that Square Enix is getting serious about releasing definite details for Final Fantasy XIII-2. 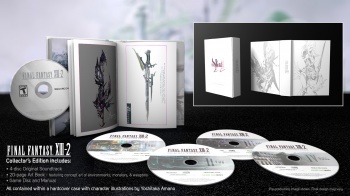 The publisher has just revealed the (unsurprising) existence of the game's Collector's Edition, which is packed to the gills with all sorts of goodies that dedicated Final Fantasy fans will undoubtedly drool over. â€¢ Alternate costume for Serah, visible throughout the game. â€¢ Unique coliseum battle against boss enemy "Omega," who joins the player's party afterward. â€¢ FINAL FANTASY XIII -Episode i- novella, an original story that ties together the events of FINAL FANTASY XIII and FINAL FANTASY XIII-2. As of right now, the Collector's Edition is a North America exclusive. Square Enix will presumably release something similar in other territories, but the publisher has yet to officially reveal any such plans.